The Victoria Falls Bridge Table was created by Richard Lowe, but inspired by the world-famous Victoria Falls Bridge. With its elegant arced stretcher and beautifully angled legs supporting a magnificent slab of two-inch-thick solid Zambezi Teak, this table is a celebration of the exquisite skill of the master artisans who carefully handcraft it. The elegant curve of the stretcher is constructed from slices of Zambezi Teak carefully laid one layer at a time over a special mould and clamped under high pressure for 48 hours to give a visually stunning solid arched beam that is virtually indestructible – just like the original bridge! The curved stretcher secures the uniquely splayed leg trusses of the table. The leg trusses are themselves hand built using a proprietary joint unique to The African Touch, ensuring the integrity of the joints for all time. The Bridge Table is a statement piece – it will uplift the finest dining room, office or boardroom. It has been used as signature piece in top lodges and restaurants. 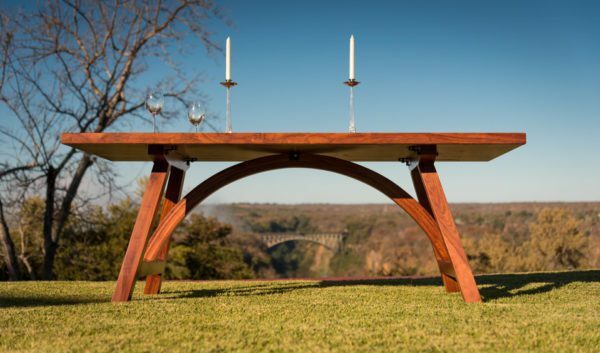 The Bridge Table is constructed from possibly the finest hardwood in the world – Zambezi Teak (Baikiaea plurijuga, formerly known as Rhodesian Teak ). Zambezi Teak is an exceptionally dense African hardwood possessed of the most beautiful, rich golden brown grain, making it one of the most valuable timbers in the world. Zambezi Teak grows on the deep Kalahari sands found in the vicinity of the Victoria Falls and Zambezi River. Please place the table top upside down on a blanket or the Air-o-Thene packing (with the steel bracket holders facing up). Place the legs between the steel bracket holders at each end of the table opposite the slots in the leg cross beam. Secure the curved stretcher beam to the leg stretcher by screwing the bolt stud into the end of the curved stretcher, sliding it through the hole in the middle of the leg stretcher and tightening in place with the nut and washer provided. The top of the curved stretcher will now touch the table top. Secure legs in place by bolting the steel brackets into the bracket holder with the bracket lip in the slot in the leg cross beam. The bracket bolt requires a 17mm wrench or socket. Finally, secure the curved stretcher beam to the table top with the remaining steel brackets.